My handmade silver jewellery is designed and made using traditional silversmithing techniques here in my Lancashire studio. The inspiration for my jewellery is often drawn from nature: hares and other wildlife, leaves, flowers, and textures that I come across while out walking my Dalmatian, Daisy. My pieces are either one-offs or small limited editions, made to my unique designs, which means that you will have the benefit of a beautiful handmade piece of silver jewellery which you are unlikely to see anyone else wearing. Why buy mass produced when I can give you designer style without the designer price tag? 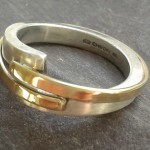 My silver jewellery is 100% handmade without using commercial shortcuts that are common in mass produced pieces. My business is named in memory of my first dog, Lucylou, who encouraged me to go scrambling about in the great outdoors, and loved nothing better than snuggling up for a cuddle when I got my sketch book out to start designing. As all my jewellery is handmade I have the equipment to make most pieces to suit you. Normally the only exception to this is rings with stones in that I have all ready made but this is dependant on the ring and stone. If you see a piece in my shop that you would like in a different size please call or contact me. If you are not sure what your ring size is I can post you a ring sizer or read my blog on ring sizing. I love what I do and hope you enjoy my jewellery too.